Since having the kids spending on me has dwindled considerably and if ever I run into trouble on a shopping trip with finding myself something to wear then my default shopping habit is to buy something for the children instead. I've also recently discovered through a shopping trip for kids footwear that not only do Clarks sell well made shoes for children, the high quality leather from Clarks also extends to the adult ranges. A few months back I went to the sales to see if there was anything that would be suitable for Isla and wonder of wonders I didn't actually buy anything for her, I bought these fabulous Clarks shoes. FOR ME! I ummed and ahhed over them. Firstly, I don't buy shoes very often, my feet are ginormous at size 8 and generally anything I like isn't available in my size. I am almost a giantess at 5 foot 11 inches, so anything with a heel is out too, so I tend to stick to the old faithful choice of trainers most of the time. On this day however everything I liked was available in my size and the only thing I had to get over was the fact that I felt a bit weird wearing shoes. In the end I realised that I couldn't leave the shop without them. But then what followed was that it dawned on me that I had absolutely nothing to wear with these fabulous shiny new shoes, so I then *HAD* to buy 3 new dresses to go with them (I don't usually do dresses either!). In effect during that one small shopping trip I had initiated a complete overhaul (yes 3 new dresses constitutes use of the word overhaul - I don't own masses of clothing!) of my wardrobe and usual style. I wore these shoes and one of my new dresses to work and for once I felt 'grown up'. I'm very casual at work usually but for at a week solid I was rocking my new shoes paired up with dresses and Isla also loved this change in her Mummy - she loves dresses and is most pleased when I'm donning one in the morning. This pair of shoes was the jog I needed to get my act together and try and make more of an effort with my appearance. Shoes like these insist on wearing something smarter and it had an effect on my mental attitude as well. I felt altogether more productive. Money well spent for so many different reasons! Funny how I didn't set out to buy anything for myself that day, I only thought that Clarks shoes were good for kids. How wrong could I have been? I love brogues, I am a big fan of a flat shoe, I never wear heels or pointy shoes, so those are right up my street! 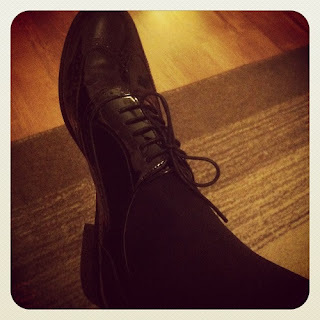 Love the mix of brogue and patent - good find. Though can't imagine life out of flip-flops at the moment, not that I'm complaining. Love those shoes! I have some similar by with a heel, but then I'm not blessed with your height. I always buy my winter boots from Clarks. I'm definitely going back there for winter boots, I reckon they'll have some cracking pairs. I'm also a big flip flop fan, but this year my feet aren't really up to scratch - need to get on to those pedicures next!